Welcome to Heritage Quest Research Library! Heritage Quest Research Library is a nonprofit genealogy library in Sumner, Washington, managed and staffed entirely by volunteers. HQRL's collection includes books (15,000 titles), and microfiche; this facility also houses a bookstore where you can purchase genealogy books, Flip-Pal® with accessories, family tree forms, software and supplies. Benefits of HQRL membership - why pay for individual data base subscriptions at home when an HQRL membership pays for six genealogy data bases for you to access at our library. 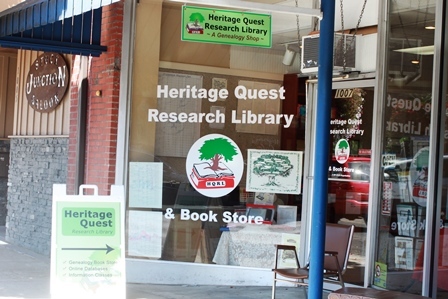 The Heritage Quest Research Library is in downtown Sumner, WA at 1007 Main Street or call (253) 863-1806. Our volunteers can help you get started researching your ancestors and show you genealogy forms to capture all the information. Consider taking a class with us or pay for a membership to access multiple genealogy data bases from our library computers. We are open from 10:00 a.m. to 4:00 p.m. Monday through Saturday, and open 10am-8pm on Wednesdays. We are closed when the Sumner School District is closed for inclement weather. The HQRL Strategic Plan was approved at the January annual meeting...you can download a copy here. You can also download a copy of the 2018 HQRL Member Survey Results.